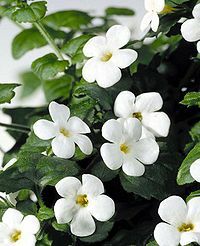 Chaenostoma cordatum, more commonly known as the Bacopa. The flower atop a Pikmin in the flower stage is called Chaenostoma cordatum, or commonly known as the Bacopa, Ornamental Bacopa, Sutera cordata or the Pikmin Flower. This real-life flower was used to model the white, five petaled, yellow centered flowers that rest on top of the first generation of Pikmin species (the colors introduced in the first game), as well as the Bulbmin in Pikmin 2. Chaenostoma cordatum also come in different colors: white, lavender, and magenta/violet. So far, in the Pikmin species, all three of these colors have been used, each symbolizing a generation of Pikmin, or a new game in the series. The magenta color has been used on all new Pikmin types (not counting Bulbmin) in Pikmin 2, or the second generation of Pikmin species. The lavender color has been used to top all the known new species in Pikmin 3, or the third generation of Pikmin. The family of these plants is called scrophulariaceae, which is also commonly called the figwort family. Onions also have a part on the top that looks quite similar to a Chaenostoma cordatum. Although Pikmin can have leaves, buds, or flower atop their stem, as decided by their maturity, Pikmin with a flower are given more attention throughout the series, given that the flower symbolizes the highest maturity. Reflecting the maturity, some rankings in the game also use leaves, buds, and flowers as icons to represent their value, with a flower commonly representing the most valuable rankings. Examples include the medals in Mission Mode and the icons that indicate a stage's completion in Pikmin 2's Challenge Mode. Because the flower is considered so important, and because of its simple, yet recognizable shape, the Chaenostoma cordatum is as much of a staple of the franchise as the Pikmin themselves. In the Super Smash Bros. series, a Chaenostoma cordatum is used as the icon for the Pikmin series. In the Pikmin games themselves, the flowers are used decoratively outside of the core game. The logotype of any game in the series is made up of several Chaenostoma cordatum, and some menus use small flower icons as markers used to represent the currently highlighted option. This is a cultivated species of flower bred with the intention of using it to market the first game. Nintendo announced the impending creation of the flower through an agreement with S&G Flowers USA in late 2001, and it became commercially available in April the following year, five months after the release of the game. The full press release can be found here. The Chaenostoma cordatum are a perennial type of plant (reoccurring every year). They are also an Evergreen, which means that even in the harsh winter climate and lack of sun, the plant's leaves can retain its green color. In addition, the flowers can live through the same weather without dying. This real life logic can be placed into the Pikmin world. The Red Pikmin are shown in Pikmin 2 in a harsh snowy landscape with the Pikmin’s leaf green and bright. The record for the lowest temperature a Chaenostoma cordatum has endured is 30 degrees Fahrenheit (-1.1 degrees Celsius). Chaenostoma cordatum are remarkably strong plants, as a result. Mr. Miyamoto must have had this in mind for the Pikmin to be strong and durable creatures. The different variants of the Chaenostoma cordatum are the Snowflake white and the Snowstorm Blue/Magenta. This is the white color from the first generation of Pikmin. This is the magenta color of the second generation of Pikmin. This is the lavender color of the third generation of Pikmin. The Bulbmin are a part of the second generation and have the white Chaenostoma cordatum. The current 3 generations. From left-to-right: Red, Yellow, and Blue Pikmin (1st generation), Purple and White Pikmin (2nd generation), and Rock and Winged Pikmin (3rd generation). A flower bed of Chaenostoma cordatum. Official Pikmin Flower press release. Flowers very similar to Chaenostoma cordatum decorate the floors of several kingdoms in Super Mario Odyssey, particularly the Wooded Kingdom and its flower roads. This article was a featured article from December 1st, 2016 to February 1st, 2017. This page was last edited on January 7, 2019, at 18:00.